As I’ve blogged previously, I’ve become increasingly dependent on TDD to the point where I’m basically addicted to the practice. I start to get nervous and twitchy if I’m writing code that isn’t driven by tests — it feels like putting a mop into a bucket of filthy water and then using it to ‘clean’. In other words, writing code without tests feels like pushing dirt around aimlessly while having no positive effect. But, I digress. The purpose of this post today is to document my implementation of TDD in Java using JUnit, coming from two solid years of almost exclusive C# work. So, bear in mind that I may make some mistakes here or violate some best practices (and feel free to comment and correct me), but it’s my hope that I get the basics right and perhaps can help someone else going from C# to Java. I won’t go into a lot of detail here, but I’m using Eclipse and have set myself up for Spring development. I had created a small, working Spring web app, and I had a little code here, but wanted to test first with any new code. To do this, I followed my C#/Visual Studio instincts and went to create a separate project containing my tests. About 85% of people from a smattering of languages favored this approach in a poll by Phil Haack, and the approach earned an answer and a vote, if not top honors, on stackoverflow. When you go this route in Eclipse, there is no JUnit project to create, so you just create a standard java project. I did this and populated it with a directory structure mirroring that of my actual application, putting the tests in the ‘same’ package as their class under test counterparts. And then, really all that was needed was to import the org.junit.Test library which, apparently, was already wherever it needed to be (I realize that this is not helpful if you don’t have it, but this really isn’t the emphasis of this post). 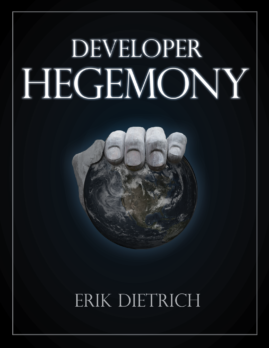 A few things to note here, fellow C# developers. One is that the equivalent of MSTest [TestMethod] is the java @Test annotation. This tells the test runner that this is a unit test. Another thing to note is that I’m using the spring framework’s assert, which may not be applicable if you’re not using Spring MVC. There is also JUnit’s assert available to you. I chose the Spring one because it had isInstanceOf(), which reminded me of MSTest’s “Assert.IsInstanceOfType()”. Now, I was primed to have a red test instead of a non-compiling one, but I needed to run the test itself. In Eclipse, there are various ways of doing it, but the closest I could come to Ctrl-R, T was Alt-Shift-X, T. Good enough – that seems to scope them the way MSTest does as well, with only the one test running, even though I defined another in a different class. 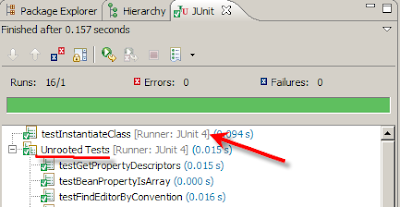 But, as with Visual Studio, there are a number of different ways to run the tests — from the little green “play” button dropdown, from the context menu right clicking on the project, from within the JUnit window that appears once you run the tests, etc. So, I ran the test, saw it fail, and deleted the return null line in favor of the one that would make it pass. A little contrived, I realize, but you’ll have to cut me a bit of slack as I iron out the early kinks. Later, I’ll write tests that fail before they pass — I promise.